I meant to blog about these cupcakes this morning, but they were for a yearbook meeting this afternoon (I know, we had to go to school during break) and I ran out of time to write a post before leaving. I still wanted to blog about them today, because I have some muffins to blog about tomorrow, hopefully. These cupcakes use my favorite chocolate base as of late. The recipe makes extremely fudgy and chocolatey cupcakes. The special secret is in the espresso powder in the cake- it deepens the chocolate flavor and makes it taste more complex. The only drawback is that this recipe makes very delicate cake and is intended for a larger cake, so the centers usually sink a bit in cupcake form. I am ok with that, since they taste so good, although you may want to keep that in mind if aesthetic appeal is important. The frosting is heavenly; there is no other sufficient adjective! The peppermint flavor is not overpoweringly strong, but you can still taste it next to the chocolate. 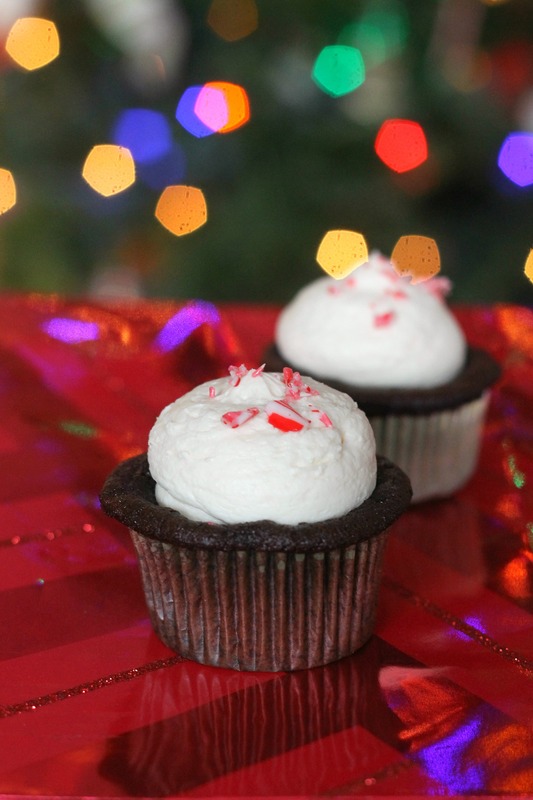 We topped ours with crushed candy canes, and a chocolate drizzle/ganache filling might be a nice addition as well. All in all, I am pretty sure that if you bring these to any sort of holiday party, people will be thrilled. To make the cake, preheat the oven to 350˚ F. Line two muffin pans with liners. In a medium bowl, whisk together the cocoa powder, espresso powder, and boiling water. When cooled slightly, whisk in the sour cream and vanilla. In the bowl of an electric mixer, beat the butter on medium-high speed for 1 minute until smooth. Gradually blend in the sugar and beat on medium-high speed until light and fluffy for 3 more minutes. Beat in the eggs one at a time. In a medium bowl, whisk together the flour, baking soda, and salt. With the mixer on low speed, add the dry ingredients in three additions alternating with the sour cream mixture, beating each addition just until combined. Divide the batter evenly in the muffin pans. Bake for 20-25 minutes, or until a toothpick inserted in the center of a cupcake comes out clean. Beat the butter on medium-high speed for 3 minutes until light and fluffy. Slowly beat in the powdered sugar, then the cream, vanilla extract, and peppermint extract. Beat for several minutes more until fluffy and well combined. Spread or pipe onto the cupcakes. Top with crushed candy canes. Serve and enjoy!